Another benefit of keeping your makeup brushes clean is softness. Makeup buildup on your brushes can make them feel scratchy. Cleaning your brushes on a regular basis will help keep them soft and supple. This is especially great for people with sensitive skin and it also helps apply your makeup with a sooth finish. So how often should you clean your makeup brushes? You should really clean them once a week if not more, this will help maintain your brushes lifespan, but I know in life we have things we need to do and don’t have time to clean them but what I do is get a big bowl of water and soap and wash them while I watch TV or YouTube but one tip is to wash them a night so they can dry over night. Below I am going to give you’re some of the best and most cost effective ways to clean your brushes. Soap – You want to use an unscented, pure, white soap for this. I generally use Nivea or Dove because they leave them really soft. With lukewarm water, get your brush completely wet. Once your brush has been saturated, swirl the brush onto the bar of soap until it lathers up nicely. Then, rinse the brush in lukewarm water. Make sure you don’t use water that is to hot or too cold. Also, when rinsing your brushes, don’t get water above the shaft or metal part. If you do it will eventually cause rust which will cause the bristles of the brush to fall out. Gently squeeze out any excess water from the brush and lay it flat on a clean towel and allow them to air dry for at least 6 to 8 hours. Detergent or Baby Shampoo and a Sponge – Take a clean sponge and wet it once again using lukewarm water. You can use either baby shampoo or dish detergent whichever one you prefer. Wet your brush making sure you saturate the brush completely. Squeeze a small amount of detergent or shampoo onto the sponge and swirl your brush on the sponge working up a good lather. Then rinse your brush with lukewarm water. You want to make sure you feel the brush when you are rinsing it to make sure you rinse all the shampoo or detergent out of the brush. If it feels slippery or slimy, continue to rinse until your brush feels clean. Once again, squeeze out the excess water and lay them flat on a clean towel to dry. 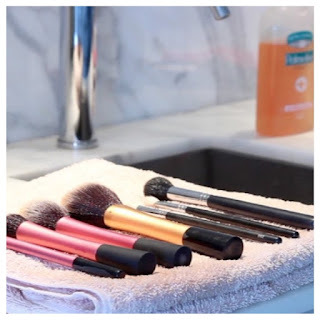 Beauty Blenders–many people don’t know how to clean these and because you put water in them before you use them they think the are clean,but the aren’t.So how to clean these,the process is pretty much like cleaning any other of your makeup brushes. You can use either a bar of soap, baby shampoo or dish detergent. Using dish detergent does make it a little easier when cleaning these because you can directly apply it to the beauty blender. Cleaning beauty blenders do take a little bit longer because of the rinsing process. Wet the beauty blender with lukewarm water and squeeze on a small amount of detergent onto it. Roll the Beauty Blender in your hands to help work the detergent completely in to it and rinse until the water is clear. Make sure you rinse these thoroughly until you see clean water when you squeeze the beauty blender. If the water isn’t clear, there is still product in the beauty blender. You may have to repeat this process a few times to get the beauty blender completely clean since they do soak up a lot of product. Once clean, squeeze out any excess water and lay flat to dry. You will know when the beauty blender is dry because it will have shrunk in size. Some brushes can feel stiff even after washing them. You want your brushes to feel soft and luxurious against your skin. If this is the case, take a small amount of conditioner in your hand and massage it gently into the bristles and rinse in lukewarm water and lay flat to dry. This will give the bristles a soft, velvety feel to them. And there you have it, easy and inexpensive ways to make sure your makeup brushes are clean and well protected. Remember, cleaning your brushes is vital in helping preserve your makeup brushes. I hope you guys like the new layout I have been working on.I wasn't really happy with my last layout so I took some time to make a new layout. Leave a comment and follow me new blogs every week.